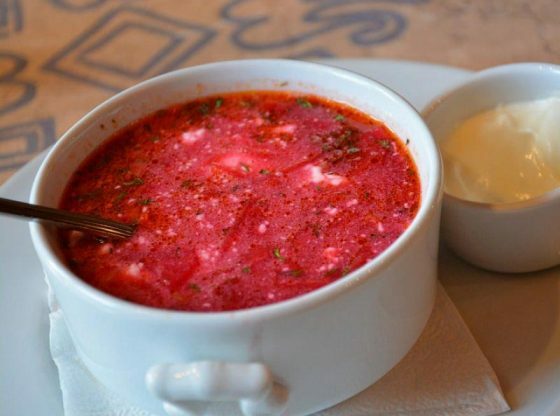 This traditional Russian borscht recipe is inexpensive, hearty, yet low-cal, and will warm you up on a cold winter’s day. Made with homegrown veggies, or, just as simply, from store-bought ingredients, it’s a big hit in the Shelton family. Why not try something new this weekend? The recipe is simple and forgiving, making exact ingredient amounts unnecessary. Each cook can adjust the recipe to suit their individual taste and pantry. This version makes a large pot, about 2-3 quarts. First, trim and peel the beets and place them in a large pot covered by 3-4 inches of water. Boil them until fork-tender, remove from water, and set aside to cool. While the beets are boiling, also get your pork going in a smaller pot, covered with water. Simmer until cooked thoroughly. Set aside to cool. Pour the pork water into the larger beet-water pot and return to a low boil. While the beets and pork are cooling, thinly slice the cabbage (as one would for cole slaw), dice the potato(es), and add to the beet water. Allow to slowly boil until cabbage and potatoes are tender. Once those are cooking, shred or dice your pork, add to the cabbage/potato pot. As the cabbage and potatoes are cooking, dice your onion and grate the carrots. Sautee them in cooking oil until tender. Back to your cooled beets: grate them and set aside. When the onions are translucent and the carrots are soft, add a couple tablespoons of tomato paste, a sprinkle ( a teaspoon or so) of sugar, and a few splashes of apple cider vinegar. Next, add the grated beets. Then, sprinkle in a teaspoon or so of dill. Give it a taste. Add any more tomato, sugar, vinegar, or dill if you feel it’s missing something. Again, this recipe is very forgiving. So long as you go easy on the sugar, you’ll be fine. This is also a good time for a little salt and pepper. Just remember: you can always add more of something, but you can’t take it out. Let the beet/onion/carrot mixture sautee for 5 minutes to allow the flavors to mingle, then transfer to the big pot with the rest of the ingredients and your bay leaves. You’re almost finished at this point. Just one last, crucial ingredient: garlic… and lots of it. Very-finely mince, or ideally, press 8-10 cloves of garlic and add it to your pot. Give it a final stir, put a lid on it, and turn off the heat. The longer you can let the borscht sit, the better, but I try to shoot for at least an hour. Now you’re ready to serve it up in a bowl, mug, or martini glass. Add salt and pepper to taste, top it with a dollop of sour cream, and accompanied with some fresh, hearty bread or crisp, green salad.